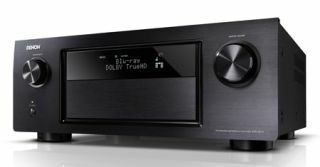 Denon launches AVR-3313 network AV AirPlay receiver for £1100 | What Hi-Fi? Denon today launches its premium AV-Art network home cinema receiver, the £1100 AVR-3313 with 4K upscaling. It follows hot on the heels of the entry-level and midrange AV-Art models announced earlier this month. The Denon AVR-3313 is a 7.2-channel device, delivering 165W to each of its seven channels. It's fitted with seven HDMI inputs, one on the front panel, two HDMI outputs, and is AirPlay compatible. Video upscaling to 4K (3840 x 2160) resolution is four times that of standard (1080p) high-resolution video. There's direct iPhone/iPad connectivity via USB, and DLNA network support for playback of internet radio and music stored on network attached storage (NAS) devices or computers. A new set-up assistant, GUI (graphical user interface) and Audyssey MultEQ XT technologies all come as standard. Naturally it will handle all the latest high-definition audio formats, as well as 3D video via HDMI. The Denon AVR-3313 will be available in black or silver from July.